Bactrocera correcta (Bezzi), often referred to as the "guava fruit fly" (although the larvae of many other species of fruit flies feed on guava - and Anastrepha striata Schiner is also called the "guava fruit fly") (White and Elson-Harris 1994), was detected for the first time in the Western Hemisphere when one female was found on 6 August 1986 in Garden Grove, Orange County, California. Two additional adult males were detected in Orange County on 9 August 1986. 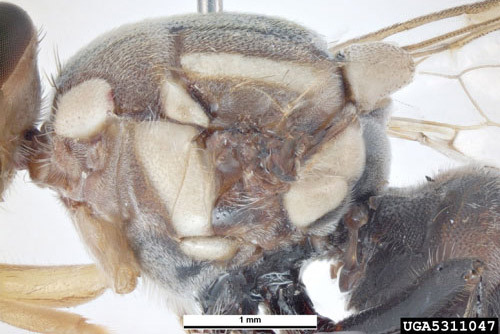 Bactrocera correcta has been detected numerous times in California since 1986 and in Florida since 1999 (Anderson and Dixon 2008), but has not become established. Within Florida, two flies were captured in the Titusville area (Brevard County) in August 1999. Single adults were captured in fruit fly detection trap in Apopka (Orange County) on 4 May 2001, in Oviedo, FL, on 30 July 2001, in Orlando (Orange County) on 29 February 2008 (Anderson and Dixon 2008), and in Orange County in late August 2011. If an infestation were to go unchecked and to become established in U.S. areas such as California or Florida, Bactrocera correcta has the potential to become a major pest of citrus, peach and several kinds of tropical and subtropical fruit hosts. Figure 1. Adult male guava fruit fly, Bactrocera correcta (Bezzi). This is the actual fly captured in Apopka, Florida on 4 May 2001. Photograph by Jeff Lotz, Division of Plant Industry. Bactrocera correcta occurs in India, Pakistan, Nepal, Sri Lanka, and Thailand. Bactrocera correcta is a brightly colored little fly, predominately black with lateral yellow stripes, approximately 5.4 mm in length. 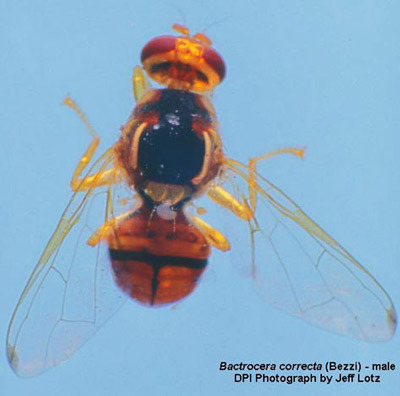 In his original description of Bactrocera correcta (as Chaetodacus correctus, Bezzi (1915)) stated that Bactrocera correcta was very near Dacus zonatus (now Bactrocera zonata (Saunders) - the peach fruitfly), but it is distinguished by the color of the thorax, and chiefly by the facial black spots being united to form a black transverse band; the whitish cross-band on the second abdominal segment is less developed, and the hind tibiae of the male are distinctly tuberculate before the end, similar to that of two closely related species, Bactrocera zonata (previously Dacus zonatus) and Bactrocera tuberculata (Bezzi) (previously Dacus tuberculatus). Figure 2. Adult female guava fruit fly, Bactrocera correcta (Bezzi). Graphics by Division of Plant Industry. Figure 3. Thoracic-Lateral view of an adult guava fruit fly, Bactrocera correcta (Bezzi). Photograph taken in Australia. Photograph by Pest and Diseases Image Library, Bugwood.org. Figure 4. 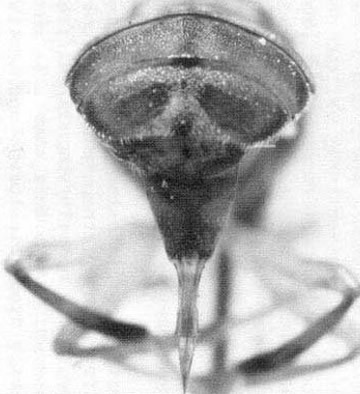 Caudal view of an adult female guava fruit fly, Bactrocera correcta (Bezzi), showing ovipositor sheath and fully extended ovipositor. Photograph by Division of Plant Industry. In his redescription of Bactrocera correcta (as Dacus correctus), Hardy (1973) noted the close relationship of this species with Bactrocera zonata and that the wing markings and morphological details are similar in the two. He indicated that Bactrocera correcta is readily differentiated by having the mesonotum predominantly black through the median portion of the mesonotum, covered with gray pubescence and with three rather indistinct subshining black, narrow vittae, rather than rufous; and usually by having a complete transverse band in the furrow across the lower part of the face, rather than the usual two black facial spots of related species. This marking sometimes is interrupted in the median portion, but in fully hardened specimens it appears to be complete at least as a narrow brown to black line. However, George Steyskal, in his letter dated 26 August 1986, observed that specimens in the (U.S.) National Museum of Natural History collection, all identified by Hardy, show distinct interruption of the two facial bars. Figure 5. 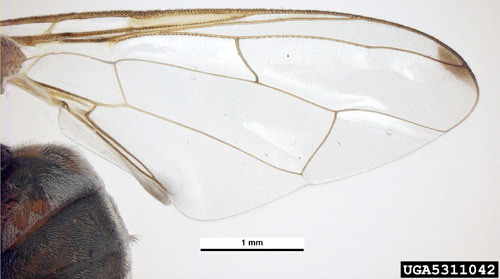 Wing of an adult guava fruit fly, Bactrocera correcta (Bezzi). Photograph taken in Australia. Photograph by Pest and Diseases Image Library, Bugwood.org. Figure 6. 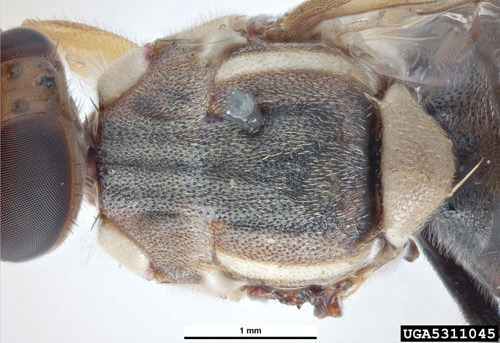 Anterior view of an adult guava fruit fly, Bactrocera correcta (Bezzi). Photograph taken in Australia. Photograph by Pest and Diseases Image Library, Bugwood.org. Figure 7. Thoracic-Lateral view of an adult guava fruit fly, Bactrocera correcta (Bezzi). Photograph taken in Australia. Photograph by Pest and Diseases Image Library, Bugwood.org. Hardy (1973) stated that Bactrocera correcta is differentiated from other species known from Thailand and surrounding regions by having the face with the black transverse band at the lower third and by having the costal end of the wing interrupted in cell R3, beyond the tip of vein R2+3. 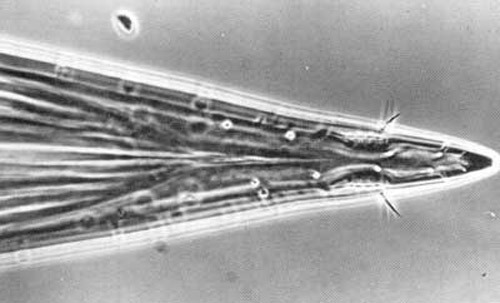 Wings are almost entirely hyaline with the subcostal cell yellow, a very faint tinge of yellow along the costal margin in apex of cell R1, and a narrow brown spot at lower apex of cell R3 and upper apex of cell R5. 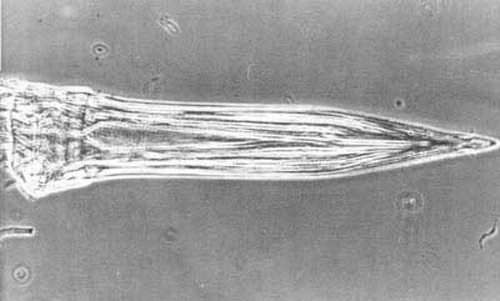 Cubital cell faintly yellow and no cubital streak developed. Abdomen rufous above except for black basal marks on terga 2 and 3 and a median black vitta from terga 3 over 5. Sterna of both sexes entirely yellow. Legs mostly yellow. Ovipositor of female red, rather short, measuring approximately 3.0 mm when fully extended. Basal segment short, approximately equal in length to terga 5 and 6 and about 0.8 mm long. Piercer gradually tapered to a short point, about 1.0 mm in length. Figure 8. Ovipositor of an adult female guava fruit fly, Bactrocera correcta (Bezzi). Photograph by Division of Plant Industry. Figure 9. Ovipositor tip of an adult female guava fruit fly, Bactrocera correcta (Bezzi). Photograph by Division of Plant Industry. Figure 10. Closeup of ovipositor tip of an adult female guava fruit fly, Bactrocera correcta (Bezzi). Photograph by Division of Plant Industry. Figure 11. 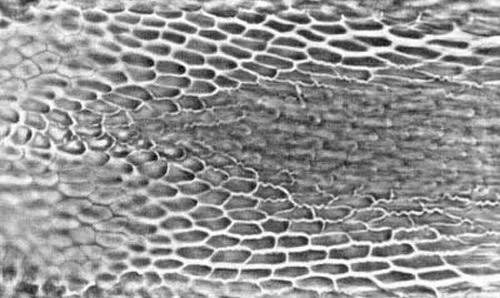 Microreticulation near base of the ovipositor of an adult female guava fruit fly, Bactrocera correcta (Bezzi). Photograph by Division of Plant Industry. Immature stages of Bactrocera correcta have not been described in the literature, and specimens were unavailable to the senior author from which to prepare descriptions. Recorded hosts include Citrus spp., Coffea canephora Pierre ex Froehn. (as Coffea robusta), Eugenia uniflora L. (as Eugenia mitchelli), Mangifera indica L. (mango), Prunus persica (L.) Batsch (peach), Psidium guajava L. (guava), Ricinus communis L. (castor bean, castor-oil-plant, palma christi, wonder tree), Santalum album L. (sandalwood, white sandalwood), Syzygium jambos (L.) Alston (as Eugenia jambos) (roseapple), and Ziziphus spp., including Ziziphus jujuba Mill. (ber, jujube, Chinese date). Bezzi (1915) noted that Bactrocera correcta lives in company with Bactrocera zonata (WW Saunders, 1841) and Bactrocera tuberculata (Bezzi, 1915), feeding on the same fruits. Bactrocera zonata, in India called "the Ranchi peach-pest," is very injurious to peach, mango, and several other fruits, including ripe Aegle marmelos (L.) Correa (Bael fruit), Careya arborea Roxb., Ficus carica L. (cultivated fig, common fig, lemon fig), Lagenaria vulgaris (white gourd), and Manilkara zapota (L.) Van Royen (as Achras sapota) (sapodilla), all of which must be considered potential hosts of Bactrocera correcta. 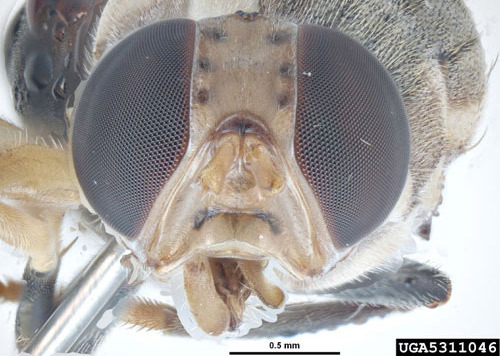 The adult female detected in California was found in a methyl eugenol-baited Jackson trap. Of the two additional adult males detected, one was trapped in a Jackson/methyl eugenol trap hung in a peach tree in Westminster, the other in a Jackson/methyl eugenol trap deployed in a grapefruit tree in Midway City. Trap density in the area of the original finds was five traps per square mile. California Department of Food and Agriculture Pest Detection/Emergency Projects personnel responded promptly by deploying Jackson/methyl eugenol and McPhail traps at 50 traps in the epicenter miles. Trapping in the surrounding 80 square miles was increased to five Jackson/methyl eugenol traps per square mile. In India, males were found to be attracted to tulsi plant (Ocimum sanctum) which yields aromatic oils, 40% of which are methyl eugenol. 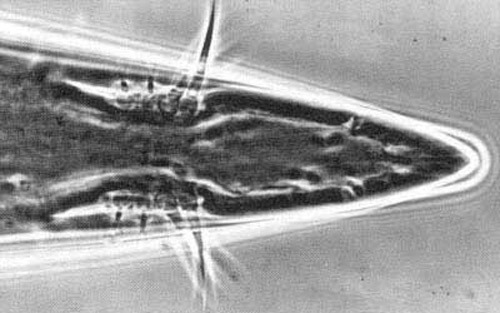 Larvae can be collected from infested fruit, killed in boiling water, and placed in 50% alcohol for two days, then to 75% isopropyl alcohol, but specific identification based solely upon larvae is difficult. Larvae of many species of fruit flies are unknown. An effort should be made to rear some larvae to adults in order to correctly associate larvae and adults and provide the basis for accurate specific identification. Adults usually are collected by use of stickyboard and baited traps. Anderson PJ, Dixon WN. (2008). Triology, Vol 47, No.1. Division of Plant Industry. (29 November 2012). Bezzi M. 1915. On the fruit-flies of the genus Dacus (s. 1.) occurring in India, Burma, and Bulletin of Entomological Research 7: 99-121. Hardy DE. 1973. The fruit flies (Tephritidae--Diptera) of Thailand and bordering countries. Pacific Insects Monograph 31: 1-353. Hardy DE. 1977. Family Tephritidae, pp. 44-134. In Delfinado MD, Hardy DE. (editors). A catalog of the Diptera of the Oriental Region. Vol. III. Suborder Cyclorrhapha (excluding Division Aschiza). 854 pp. The University Press of Hawaii, Honolulu. Kapoor VC, Hardy DE, Agarwal ML, Grewal JS. 1980. 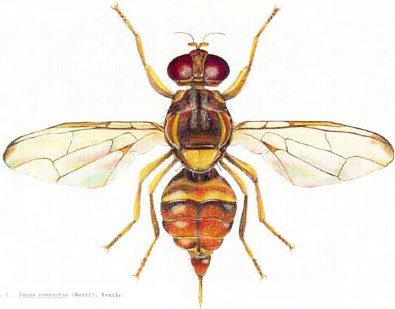 Fruit fly (Diptera: Tephritide) systematics of the Indian subcontinent. Export India Publications. Jallundur, India. 111 pp. Steck GJ. (August 2002). A guava fruit fly, Bactrocera correcta (Bezzi) (Tephritidae). Pest Alert. (29 November 2012). White IM, Elson-Harris MM. 1994. Fruit Flies of Economic Significance: Their Identification and Bionomics. CAB International. Oxon, UK. 601 pp. Authors: Howard V. Weems, Jr. (retired), Florida Department of Agriculture and Consumer Services, Division of Plant Industry; and T.R. Fasulo (retired), University of Florida. Originally published as DPI Entomology Circular 291. Updated for this publication. Publication Date: March 2001. Latest revision: November 2012. Reviewed September 2018.